Ask any person the first thing they remember about Singapore, and their answer would be Merlion. This answer may differ for shopaholics though! Singapore’s most iconic symbol resides at the waterfront Merlion Park. Reimagined as a union of a mermaid and a lion, this icon stands for something more. The body (mermaid) symbolizes the country’s humble roots as a fishing village called Temasek which roughly translates to “sea town”. The head (lion) represents Singapore’s original name, Singapura which means “lion city”. 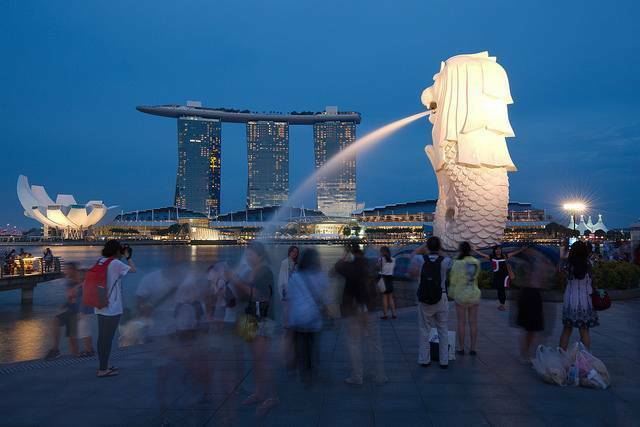 With water spouting from its mouth, the Merlion stands at a height of 8.6 metres and weighs 70 tonnes. Also present in this park is a Merlion cub which is 2 metres tall and weighs 3 tonnes. Tourists can take photographs with the two Merlions as lasting memorabilia. People can further explore this park via restored bumboats and see other attractions such as Clarke Quay and Boat Quay which, just like the park, are also located along the Singapore River.